Adult Dog Food Puppy Food Cat & Kittens Why Choose Simply WIld™? 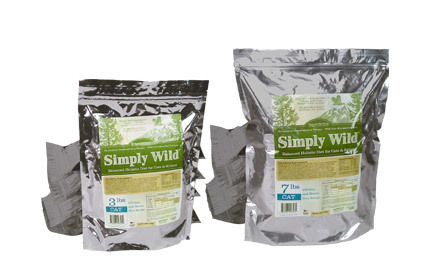 Simply Wild Natural Dog Food is formulated to meet the nutritional requirements established by the AAFCO Dog Food Nutrient Profiles for "All Life Stages". *Not recognized as an essential nutrient by the AAFCO Dog Food Nutrient profile. Chicken, Chicken Meal, Fish Meal, Turkey Meal, Brown Rice, Oatmeal, Chicken Fat, Pearled Barley, Herring Oil (Omega 3 fatty acids), Natural Flavors, Flax Seed, Dried Egg Product, Brewers Dried Yeast, Veggie Pomace, Apples, Alfalfa Meal, Rice Hulls, Calcium Carbonate, Choline Chloride, Potassium Chloride, Vitamin E Supplement, Taurine, Carrots, Fructo Oligosaccharide, Salt, Zinc Proteinate, Zinc Sulfate, Yucca Schidigera, Iron Proteinate, Dried Blueberry Product, Selenium Yeast, Ferrous Sulfate, Mineral Oil, Copper Proteinate, Dried bacillus subtilis fermentation Product*, Dried lactobacillus acidophilus fermentation product*, Dried bifidobacterium thermophilum fermentation product*, Dried bifidobacterium psoudolongum fermentation product, Dried enterococcus faecium fermentation product*, Manganese Proteinate, Vitamin A Supplement, Copper Sulfate, Niacin, Pantothenic Acid, Manganese Sulfate, Vitamin B-12, Riboflavin, Biotin, Vitamin D3 Supplement, Selenium, Cobalt Proteinate, Thiamine, Pyridoxine, Ethylenediamine Dihydroiodide, Folic Acid, Cobalt Carbonate. Copyright © 2013 Simply Wild Food • All Rights Reserved.